Just outside of Brantford, Ontario, Garden Avenue leads south off Highway 403. Industrial parks, warehouses, and gas stations dot the landscape between long stretches of farmer’s fields. Garden Avenue passes through Henry Street, Johnson Road, and then Ewart Avenue — all unremarkable names in southern Ontario. 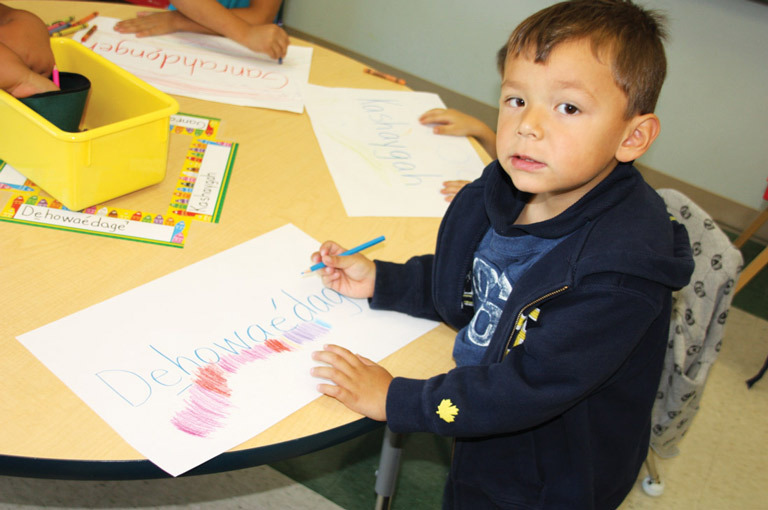 A student at Kawenni:io Private School on the Six Nations of the Grand River Reserve practises his spelling. Then the European names on the signs begin to change. Old Onondaga Road intersects Garden Avenue. Then Oneida Street. Then Tuscarora Street. The road curves, and the Grand River comes into view. Another turn south and the road leads through Ohsweken, the main village of the Six Nations of the Grand River reserve. In a geographical sense, the place names on the reserve reflect its heritage. The six Indigenous nations of the old Haudenosaunee (Iroquois) Confederacy — the Mohawk, Oneida, Cayuga, Onondaga, Seneca, and Tuscarora — settled here after the American Revolution. But, in another sense, the place names, and the road leading through the reserve, mark a journey back to a time before Europeans arrived in this area. A sign reading “Thank You/Niaweh for Visiting Mohawk Trading Post” sits beside the road, hinting at a time here when niaweh was uttered more often than thank you. The road continues through the mostly rural reserve, past forests, simple two-storey homes, and cars rusting in fields. One can picture the scene as it was two hundred years ago: a dirt road, horse-drawn carts rolling along, and residents conversing in Haudenosaunee tongues. An imposing, three-storey building appears on the left — the Iroquois Lacrosse Arena. Outside is a sign for Kawenni:io Private School. Inside, visitors are greeted by a colourful mural depicting three figures in traditional buckskin clothing holding hands. Along the top is written She:kon/Sge:no — which means hello in Mohawk and Cayuga. Kawenni:io is a Mohawk and Cayuga language immersion school where students are taught the fundamentals of Haudenosaunee culture. For instance, posters on a wall depict wildlife considered sacred to the Haudenosaunee. Mohawk names are printed underneath the pictures: a’no:wara (turtle), ohskennon:ton (deer), ohkwa:ri (bear), and kentson (fish). Kawenni:io’s curriculum isn’t just an exercise in specialized education; it’s an attempt to address a cultural crisis. Indigenous languages in Canada are rapidly declining. A 2011 census by Statistics Canada lists fifty-seven distinct First Nations languages. The majority of those have less than a thousand speakers, most of whom are elderly. In British Columbia, a 2010 report described all of the province’s thirty-two indigenous languages as endangered, with three having no known living speakers. Of the Iroquoian language family to which Ontario’s Six Nations languages belong, Mohawk has 545 speakers, Cayuga has 240, and Oneida has only 180. There are many reasons for the decline, including the legacy of Indian residential schools, where Indigenous children were not allowed to speak their own language and were sometimes punished for doing so. The government-funded, church-administered schools operated across Canada from the mid-nineteenth century until the 1990s. In 2008 the federal government apologized for the significant harm done to children who were separated from their families and exposed to abuse. Today the school is funded through the federal department of Aboriginal Affairs and Northern Development Canada (AANDC). It has about a hundred and forty students from kindergarten to Grade 12. Until Grade 6, the students receive all their education in either Cayuga or Mohawk. From Grade 7 onwards, half of their classes are taught in English and half in a Haudenosaunee language. But Gerrard has yet to become fully fluent in the language. His parents raised him to speak English, and he faces the same challenges that Haudenosaunee languages present to any student. Simply put, they are tough to learn. Most Indigenous languages in North America are known in linguistic typology as polysynthetic. Words and concepts are formed by adding on prefixes and suffixes, which mark things like person, gender, and number. One word in Mohawk would be an entire sentence in English. It can result in very long words. Students of Kawenni:io Private School give a presentation to members of the Six Nations of the Grand River Reserve in southern Ontario. A two-and-a-half-hour drive north of Brantford’s Six Nations territory brings a visitor to the shores of Georgian Bay on Lake Huron. The names here also point to the history of the region. There is Nottawasaga Bay — Nottawasaga in Algonquin means “Iroquois at the mouth of the river.” There is Wendake Beach — Wendake means “land of the Wyandot” in the old Huron/Wyandot language. And there is Ossossane Beach — named by the French to denote a large Wyandot ossuary that was excavated just east of the beach. East to Midland, the road leads to the historical site of Sainte-Marie Among the Hurons, a reconstructed Jesuit village from the seventeenth century. It is an outdoor museum where visitors can learn about the first European settlement in Ontario — a settlement located in the heart of Wyandot country. Disease — and war with their distant cousins the Haudenosaunee — scattered the Wyandot people from this area in the mid-seventeenth century. Some of them fled to Loretteville, near Quebec City, where their descendants live today at the Wendake reserve. Others migrated south into the United States. Today there are three Wyandot communities in Kansas, Oklahoma, and Michigan. But along the roads to those four Wyandot communities something is missing: their original language. Its last native speakers died a century ago. Its last fluent speaker, Sarah Duchene of Oklahoma, died in the 1960s. When Duchene died, a road stretching back thousands of years hit a dead end. And beyond was a gaping, dark pit. Songs, poems, jokes, oral histories, and stories disappeared and went silent. The road is gone, but the tools to rebuild it remain. Some people are using those tools to build a new pathway to an ancient language. 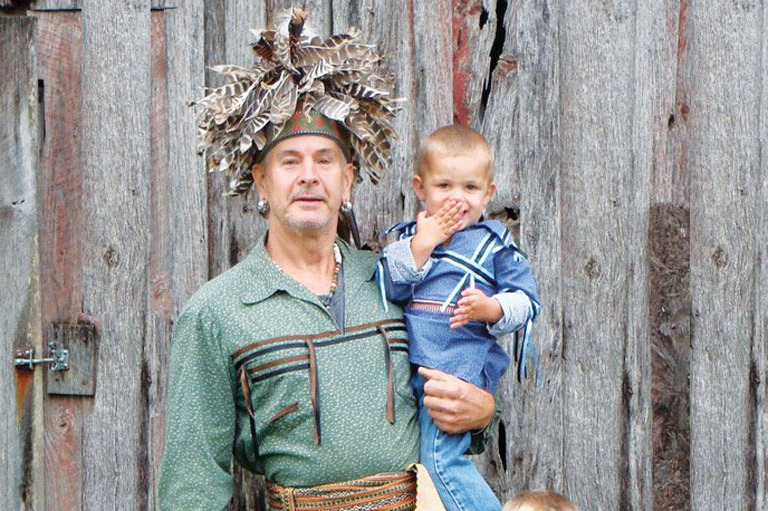 Wyandot artist Richard Zane Smith with his grandsons. Jesuit missionaries spent years living among the Wyandot and Haudenosaunee in the seventeenth century, and they left behind translations of Wyandot, including word lists and grammars. The diaries of Jean de Brebeuf and Gabriel Sagard are not only linguistically rich but also fascinating descriptions of Indigenous life before European influences intensified. Often the Jesuits studied the languages under the grim conditions of war, epidemics, and religious persecution. Smith’s own journey with the language began in the late 1980s. He discovered word lists of Wyandot with English translations. “I gathered as much as I could, but I wanted to be able to do my own prayers in the language, and I was in sweat [lodge ceremonies], and I wanted to speak as much Wyandot language in the sweat lodge. So in a way it kind of started by wanting to do prayers,” he said. Waja setere entere entran ahsen! But it wasn’t a spiritual chant. It was a one-to-ten numbers song for children. It’s one of the basic ways to get them started in a language that has no speech communities, no speaking environments in which students can be taught to interact. The Chinese philosopher Lao-tzu said, “A journey of a thousand miles begins with a single step.” The road to resurrecting Wyandot will indeed take a thousand proverbial miles. The task seems overwhelming. All four Wyandot communities are surrounded by English and French speakers. And, even if each community managed to raise the next generation speaking fluent Wyandot, what then? They would eventually need to leave the community to work and enter a world of European languages. It would be difficult to keep Wyandot strong if the language was spoken only at home and not in the larger world. 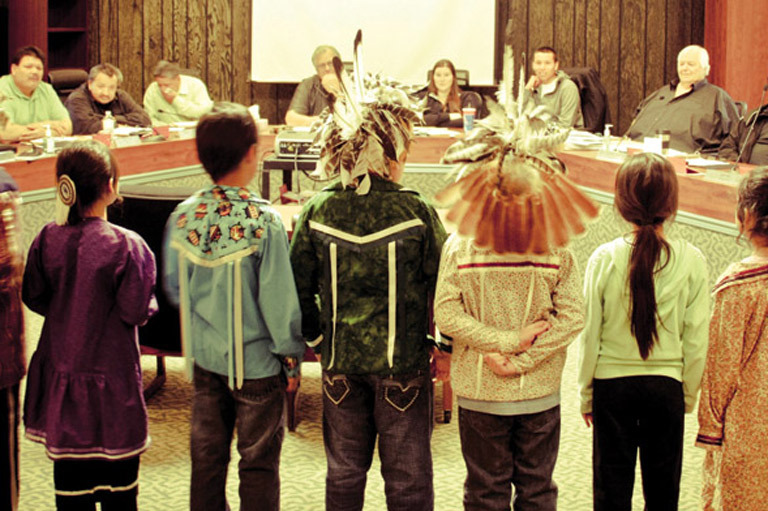 In Ontario, the Six Nations community faces the same challenges. The field of language revitalization is tiny and lonely. Success stories are very few despite many efforts to revive endangered languages around the world. But there are encouraging initiatives afoot. Cornish, a Gaelic language that was spoken in southern England, has undergone a slow revival after its last native speaker passed away in the eighteenth century. Today, several hundred people claim to be fluent in Cornish, though there are few reports of children being raised as native Cornish speakers. There is, in fact, only one example of successful revitalization: Hebrew. Its status as a spoken language faded away thousands of years ago, but it remained a written language for religious purposes. In the late nineteenth century, as the Zionist movement expanded in Europe, Jewish scholars adapted written Hebrew into a spoken language. They borrowed new words from European languages or Semitic languages like Arabic and Aramaic to compensate for gaps in the ancient language. Jewish immigration to Palestine increased in the twentieth century, and Hebrew unified the multinational migrants into one speech community. By the time Israel became a state in 1948, Hebrew was already the language of Jewish institutions there. Today Hebrew is the national language of Israel and has over five million fluent speakers. Thirty years down the road, it’s possible that young people at Six Nations could be fluent in a Haudenosaunee language. Will the Wyandot road reach a destination like Hebrew? Craig Kopris, a professional linguist, thinks it’s possible but that the chances are slim. Kopris is a language consultant at the University of Maryland Center for Advanced Study of Language. He has studied several Indigenous languages and wrote his PhD. dissertation on a descriptive grammar and dictionary of Wyandot. He sometimes travels to the Wyandotte Nation reservation in Oklahoma to help its members to develop language materials. Over the phone from Washington, D.C., he explained that there are only some parallels between Hebrew and Wyandot. Kopris said Wyandot may be starting to wake up at the Wendake reserve at Loretteville. “In Quebec, I was originally pessimistic. But I started seeing the results and the number of people interested in learning the language and how much time and effort they were putting into it. Just seeing how people were using greetings and even more complicated phrases with each other, I’ve become more of an optimist,” he said. In Ontario, the concrete-and-glass buildings of Toronto’s Humber College seem an unlikely place for the revival of an ancient Indigenous language. But Humber could be hosting the beginnings of a developing Wyandot liturgical core. Professor John Steckley of Humber College has written a Wyandot dictionary. The dictionary he published in 2007 was the result of thirty years of study. He spent a lot of time breaking Wyandot words down into verb and noun roots, and he compared them with words from other Iroquoian languages. By the looks of it, Steckley could be ready to publish a second edition of his dictionary. His own copy is filled with revisions of his translations, with French, Seneca, and Mohawk notes scrawled in blue pen. Linguists say that of the fifty-seven Indigenous languages spoken across the country only three — Cree, Ojibway and Inuktitut — have a healthy chance of long-term survival. The 2011 Statistics Canada census on Indigenous languages states that 83,145 people speak Cree, 19,275 speak Ojibway, and 34,110 people speak Inuktitut. Those languages are strong for least three main reasons. One is population size. Cree, Ojibway and Inuktitut all have large populations spread across several territories and provinces. In the case of Cree, “it’s just sheer numbers” of speakers, said Neal McLeod, a Cree and an associate professor in the indigenous studies department at Trent University in Peterborough, Ontario. McLeod, who grew up on the James Smith reserve in Saskatchewan and teaches literature and Cree language courses at Trent, said a second reason the languages have endured is because they are written in a distinct syllabic alphabet. English missionary James Evans devised the syllabic script in 1840 while studying Ojibway and Swampy Cree. A number of Indigenous languages from the Algonquian, Inuit, and Athabaskan language families have since adopted the phonetic writing system. A third explanation, although less quantifiable, is that those language groups have large numbers of speakers living in rural or northern areas, far away from the influence of mainstream urban centres. Compare that to where Mohawk and Cayuga are spoken at Six Nations, a community close to major cities like Brantford, Hamilton, and Toronto. And the Haudenosaunee, like the Wyandot, have had longer contact with European Canadians than most other Indigenous groups. First Nations students at the University of Winnipeg, where Cree and Ojibway are taught. Another development helping to keep Indigenous languages alive is that over the past several decades there has been an increase in the number of post-secondary Indigenous language programs. Today, most universities in Canada offer Indigenous studies programs, and language instruction is often a component of those programs. For instance, at the First Nations University of Canada in Regina, classes are offered in Cree, Dakota, Dene, Nakota, and Saulteaux, and students can obtain a bachelor of arts in Cree, Saulteaux, and/or linguistics. 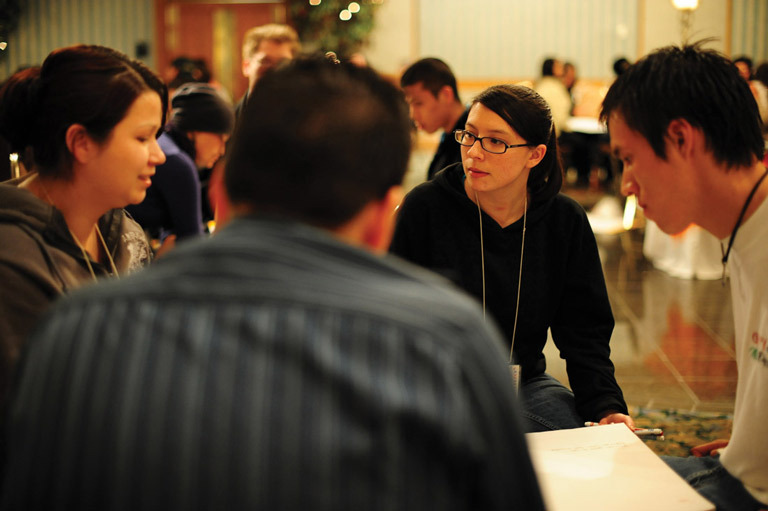 At the University of British Columbia, students can learn Salish. Carleton University in Ottawa offers Inuktitut, while Cape Breton University in Nova Scotia includes Mi’kmaq in its curriculum. It is late afternoon, and back at the Six Nations reserve, just south of Hamilton, the hallways of Kawenni:io are quiet now that classes are done. Teacher Connie Johnson sits at a desk in her classroom and prepares a lesson for the next day. She teaches the Grades 5 and 6 Mohawk classes. She was one of the original students to attend Kaweni:io after it opened, graduating in 1999. On her whiteboard is written a short conversation in Mohawk about jobs. “Oh naho:ten ni:se saio’te?” — “What is your job?” Arithmetic charts are attached to one wall and include the Mohawk words for each number and mathematical function. She points at two pictures of men drilling holes in maple trees to attach a sap spout. “They’re learning how to say “I am drilling it,” “Te’s drilling it,” “we’re drilling it.” The kids in my class can pick out prefixes and verbs,” she said. Soon she will drive home to her family, and then she’ll come back to Kawenni:io the next day to work. Each day she works here she travels a road, a road she is slowly building and extending, however tentatively, into the future. Will her road — the road of the Haudenosaunee — stretch further out where the language and culture are strong again? Or will the languages pass into history? Not if Johnson can help it. Johnson closes her notebook, puts on her jacket, and leaves her classroom. She walks through the front lobby towards the stairwell that leads down to the parking lot. “Niaweh,” I say to her. “Niaweh,” she answers. Editor’s Note: Kawenni:io school principal Isabel Jacobs passed away after this article was written. Canada’s History offers its condolences to her family and community. Blair McBride is a freelance journalist and copy editor at the Bangkok Post in Bangkok, Thailand, where he lives. A graduate of the master of arts in journalism program at Western University in London, Ontario, Blair studied Mohawk while attending McMaster University in the early 2000s and also at the Kanatsiohareke Mohawk community in Fonda, New York. He has published articles in various publications, including the Hamilton Spectator, the London Free Press, and Canadian Business magazine. Not only was this Canadian's life story fictionalized for the film The King and I, Anna Leonowens was instrumental in the founding of the Nova Scotia College of Art and Design.